Senators Fischer and Sasse support the Republicans’ tax plan give a handout to the top 1%, while it would hurt working Nebraskans and exploding to the federal deficit. Even Trump’s advisor, Larry Kudlow, has said the bill will “hurt a lot of different people”. While Senators Fischer and Sasse are pushing this destructive bill on Nebraskans, 50,000 kids on CHIP in our state are at risk to lose their health insurance because the GOP has not funded the program. The Republican tax bill would take more than $5 billion from middle-class families to give to the rich. Over 80% of households would have their taxes increase or see no change, while about 60% of households making over $1 million would get a tax cut. The Republican tax bill is designed to please their wealthy donors, not the middle class. 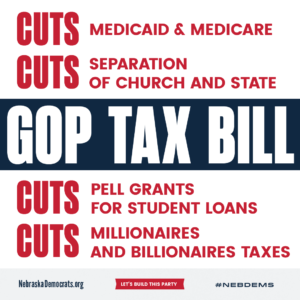 To show our Republican Senators that you don’t want to fund tax cuts for billionaires by putting Nebraskan children at risk, call them and let them know, or visit their Facebook pages and tell them.